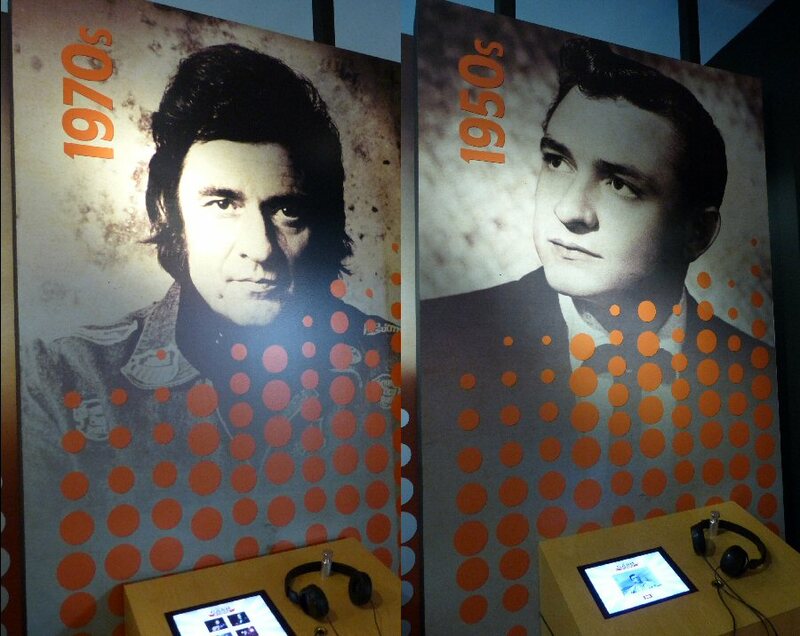 The Legacy of Johnny Cash lives at the Johnny Cash Museum. The brick building located at 119 3rd Avenue in the heart of Downtown Nashville, Tennessee features memorabilia, music and more from the legendary Johnny Cash. Johnny Cash aka “The Man In Black” was born February 26, 1932. Johnny grew up on a farm in Dyess County, Arkansas. At a young age he was exposed to folk and religious music. Cash’s early days would later influence his life and music. In 1954, Johnny auditioned for Sam Phillips at Sun Records. The song “Cry, Cry, Cry” established him and the rest is history so to speak. Cash continued to make music until his death in September of 2003. Johnny released American IV (2002) produced by Rick Rubin. The record featured a cover of the Nine Inch Nails’ track “Hurt”. The album and song received much acclaim earning Johnny a number of awards including a MTV Statue for his compelling video of “Hurt”. There were listening stations to sample Cash music through the decades. On 3rd Avenue, there is a store front with a coffee shop that are open to the public. The Johnny Cash Museum is behind the retail space. One of the first displays we encountered on our visit to the Museum on January 13, 2016 were the original amps and instruments from the 1950’s recording sessions. There was a dollar bill under the strings of Cash’s guitar with a plaque explaining that Johnny used paper to create a muffled strumming sound. Folks know Johnny for his music but there were many more shades to “The Man In Black”. He was an artist and activist. Not only did Cash perform at prisons (not a popular thing to do) but he also involved himself in prison reforms suggesting rehabilitation rather than punishment for small offenses. Johnny stood up for Indian rights among other causes. Johnny gave generously to orphanages. Johnny was also a believer. Although he had strayed from the faith for a number of years he re-committed himself to Jesus. Johnny and June traveled to the Holy Land often bringing associates and friends with them. Cash released a number of gospel records, too. Speaking of records the Johnny Cash Museum has plenty from 45’s, to album covers, to Gold/Platinum Records. In total 96 studio albums which includes collaborations were released by Johnny. 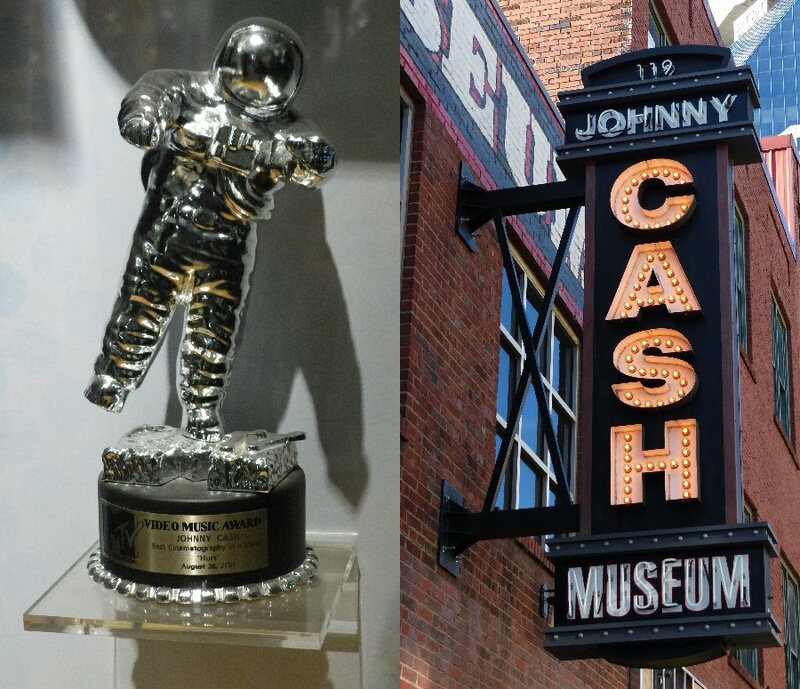 Johnny Cash’s “MTV Moon Man” is on display in Nashville. Following Cash’s catalogue is also a lesson in the distribution of music. He recorded songs at a time when single 45s and albums were the main formats for music. Eventually cassette tapes, 8-tracks and CDs became the norm to later be replaced by digital and YouTube. Johnny’s timeless tales have withstood the test of these changes and other trials. Cash also hosted Christmas and Variety Shows in the 1970’s which can be seen today on DVDs available for purchase in the Museum’s gift shop. The Johnny Cash Museum also has a theater. During our visit we watched a documentary of all the films and TV shows Johnny had appeared in. Cash ran the gamut from a villain to the voice of a spirit guide coyote on an episode of The Simpsons. There were also audio and video displays. We got a big kick out of out of a re-mixed, dance version of “Get Rhythm”. 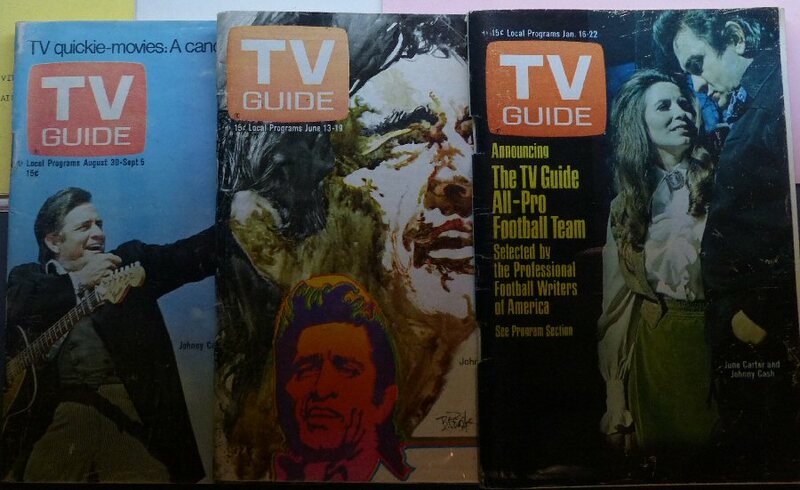 Johnny Cash was a household name as a television star in the 70’s. Johnny Cash was larger than life and he had the suits and size 13D boots (also at the Museum) to prove it. Other personal items along with his King James Bible can be seen at the Museum. There is also dinnerware and furniture along with information about the Cash’s home and The House of Cash Museum that were in Hendersonville, Tennessee. There are instruments to be seen along with the Soundcraft Ghost Board that was utilized for much of Johnny’s last recordings with Rick Rubin. 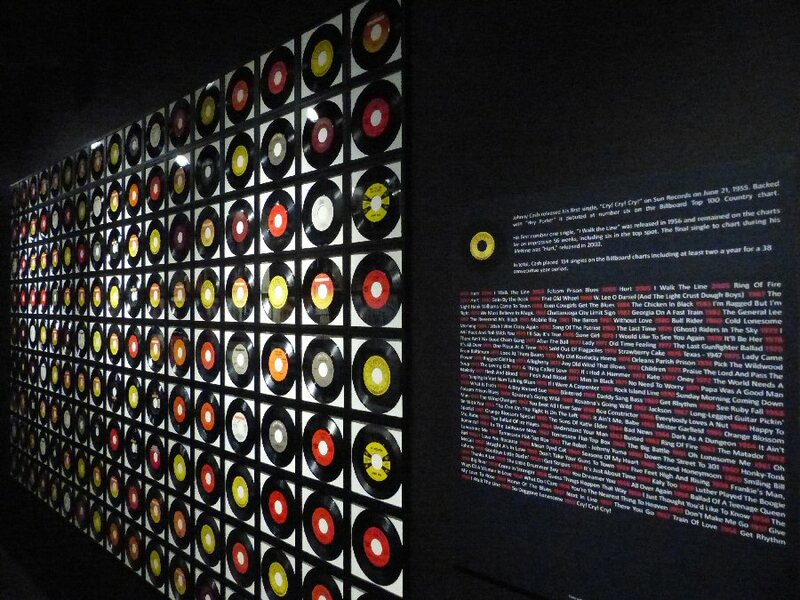 “Hurt” can be heard in parts of the Museum as the song/video is on a loop at one end of the room. It is truly a haunting piece of art. Also upon the Museum walls are concert and film posters. Johnny Cash released many singles during his long-lasting recording career. The collection at the Johnny Cash Museum in Nashville is impressive. When we were there in January there were signs indicating that they were expanding the place, which should mean more information and items for folks to absorb. 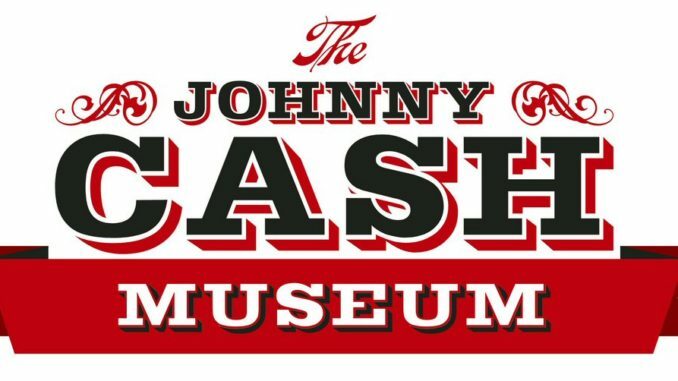 The Johnny Cash Museum is carrying on the legacy of “The Man In Black” with a career spanning exhibit of artifacts, audio, memorabilia, music, personal effects and videos. For new and old fans it is the place for everything Cash.